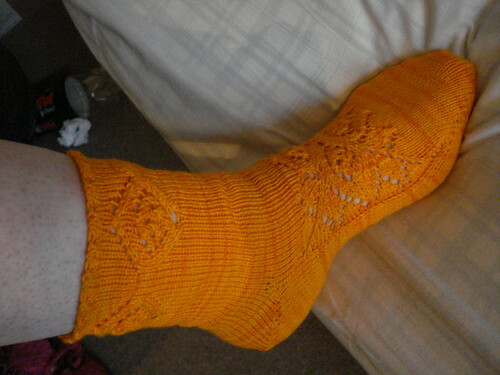 I'm a really big fan of knitting socks. They're cute, practical, and quick. 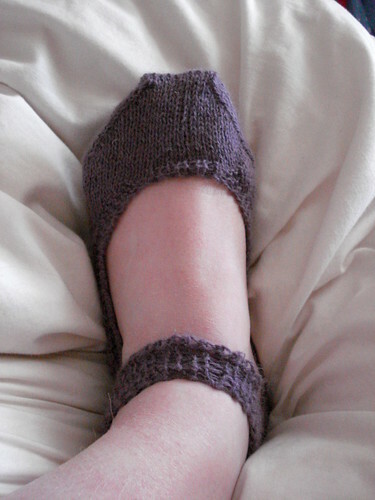 Another big plus is that they're knit in the round, so there's very little purling and no seaming. The last few sock projects I've done have been a little different, though... They've involved knitting back-and-forth, for one reason or another. First, there's these 'comfort slippers'. It's a great pattern, and a Japan benefit as well. Basically they start off like a top-down sock, with a short cuff. Then you do a heel, and from that point forward it's back and forth until the toe. It gives them an adorable 'Mary Jane' look, and they're comfy slippers as well. I knit mine in alpaca, so they're really warm, soft, and cozy. Grun ist die Hoffnung, a terribly clever pattern by Stephanie van der Linden. It starts with the lace medallion motif in the center - then you knit down, around the toe, up the sole, then from the heel to the cuff like a regular toe-up sock. It's so brilliant to see the sock take form. 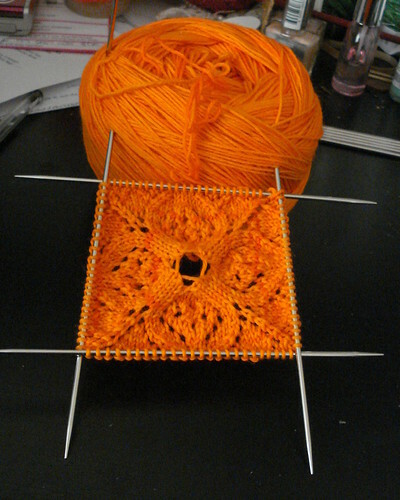 It's knit in Wollmeise, the color is Kuken (WD), and yes, it really is that bright. It's an incredible neon orange. I adore it. The pattern isn't perfect (it's free, short, a bit vague and very plain, and I made some mods for fit), but I love the design possibilities that a center-out sock imply. I intend to play around with this construction method.